We are a leading service provider for the Gemstone Authentication Report. We are acknowledged for the accurate and most high quality Gemstone Authentication Report that we offer to our clients. Our in depth knowledge about the gems allow us to offer most critical and genuine report about the quality and grade of the gems. We work for the best interest of our clients and for the love of gems that we nurture. In addition it can create customized Certificates and packaging for its clients. 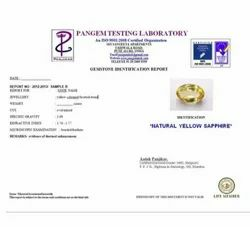 Looking for Gemstone Authentication Report ?